With the coming of a new member in the family, the expenses will also rise. With the coming of a new member in the family, the expenses will also rise. Housing, education and costs for food will surely increase your monthly expenses to a large extent. Thus, it will be better if parents consider saving expenses while raising their children. 1. Saving money on housing expenses: Buying a home and paying off the mortgage payments can be quite costly. So, it's better to not consider moving to a new and big house immediately before or just after child birth. It's true that you will need a big house and more space to accommodate and bring up your child. But there's no need to panic when the child is due. Rather, you should take your time to save money and then buy a bigger home 2-3 years later. You can even think of shifting to a rural area as properties will be cheaper there. Co-housing (someone willing to pay to live with you) can also be a good option to save money on housing. 2. Saving money on child-care: Child care is quite expensive during the early years. When both the spouses are working, if possible they can get a relative to watch the kids. Baby-sitting co-ops can also be a less-expensive option for the parents. Apart from that, parents may also apply for flexible work hours with their employers. It will help one parent to take care of the child when the other is at work and vice-versa. This will help both the spouses to spend quality time with the kid. It will also save money in the long run. Nanny-sharing has also become quite popular these days. One nanny can watch the kids from several families and they can share the cost of appointing a nanny. 3. Save money on education costs: Your child's education is very important for his/her future. You should start saving money for your child's education immediately when you plan to have a child. You can establish a trust fund for your child's education. Later on, money from this trust fund can be used for his/her college education. You can even take the help of professionals in order to save money for your kid's education. 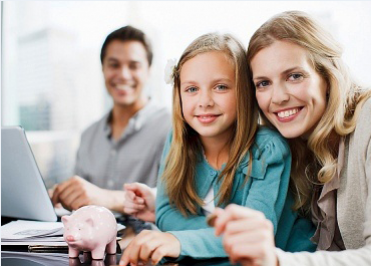 They can suggest you sensible stock investment options helping you to secure your child's future. 4. Saving money on food: In order to save money on food, you can try out growing fresh organic food in your own garden. This will help you in saving quite a lot of money. You can also save money on food by going for low cost food boxes offered by Angel Food Ministries. You will be able to get a box of fresh and frozen food at a cost of $30. The parents will be able to spend the money, which they save from this, on their children.